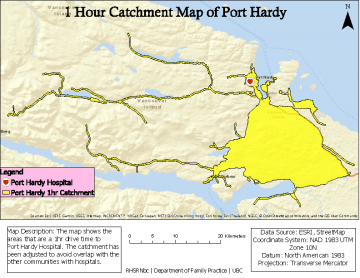 Our GIS Catchment Tool will consist of one-hour drive time catchment maps which is comprised of rural communities and a hospital that resides within the population catchment. 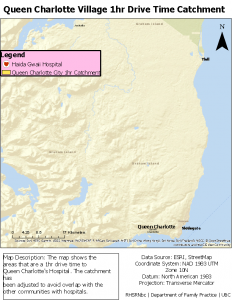 In using this tool, it will enable researchers to use this tool to apply spatial analysis on patient flow patterns with respect to the level of health services that is available to them. The tool will link health service/interventions with health outcomes through isolated groupings of people found in rural communities, which will enable us to test out new models of health care. 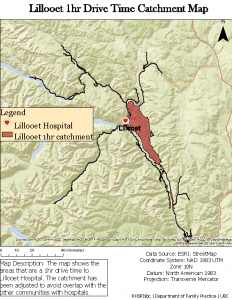 Furthermore, these catchments will help us determine the proportion of the population in BC that do not have access to healthcare services. We first identified the hospital within our community of study and then create a one hour drive time catchment, which includes all the areas that are within a one hour drive time to the hospital. We use the Network Analyst extension on Arc GIS to derive these catchments and use the road network data from Streetmap. Moreover, we account for catchment in close proximity and avoid overlap by placing ‘line barriers’ to separate them. We first searched up the drive time between one community’s hospitals to the overlapping community’s hospital and then placed a line barrier half way on the road that connects them. This way the solution avoids catchment overlap, while allowing for unique catchments. Once the unique catchments are created, we use the intersect tool on Arc GIS to calculate the postal codes that reside in the catchment and the catchment population size. We derive the postal code and population data from ‘Abacus Dataverse Network’ (UBC Library). Currently, we have created 1 hour drive time catchment maps for 63 communities in rural BC, using the Network Analyst extension on Arc GIS. Although an effort has been put in to minimize error, the project has some limitations. To calculate population size Census Dissemination Blocks (DB) have been used, which is the smallest geographic unit of the census. DB’s align to road networks, which were used to create the catchment and to provide a better estimate of the population size of the catchments. However, it is not always perfectly aligned with the roads , as it can include people that do not reside in the catchment, vice versa. This is not a major error, as it occurs more towards the edges of the catchment and from our population pattern it is evident that most of the population is clustered close to the hospital. Streetmap was used to create the one hour catchments for the communities. Streetmap only updates once a year or once every couple of years. Since our scope is limited to rural areas, we believe the road networks should not change much, however our data would not be able to showcase these small changes until street map is updated. Human error is another limited in this project, as the solution is only being run by one person. However we have taken measures to lessen human error through our quality check system as mentioned above. There is yet a slight chance of some postal codes or population counts being missing from our dataset. 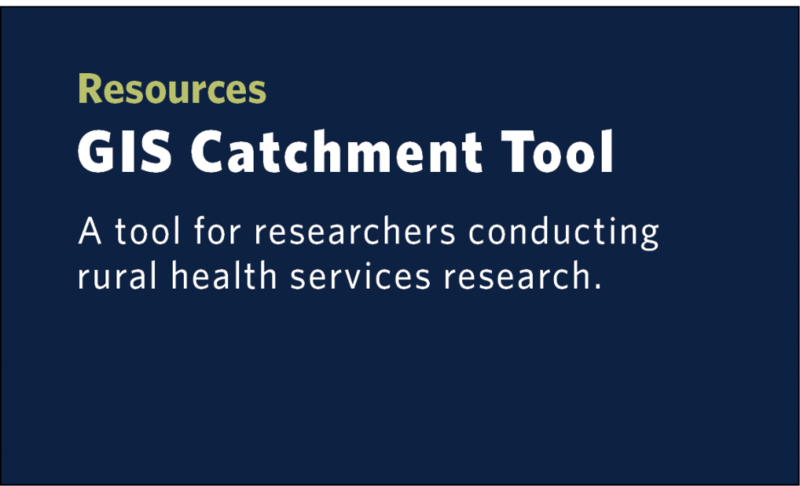 Some of our next steps in developing this tool is expanding the scope of this project by increasing the number of catchments by including more rural communities in BC and to include key services of interests such as emergency, maternity, anesthetic, palliative care services and more. We are beginning to account for the urban areas in BC by separating them from the rural catchments, so that rural communities don’t include urban areas that are close to in their catchment. When our dataset in complete, we strive to create an interactive map that will aid researchers to find appropriate data for their research. If you would like to know more details about the project or to access this tool, please contact us!